Two Explosions Rock Boston Marathon Finish Line; At Least 3 Dead, Dozens Injured : The Two-Way NPR's Dina Temple Raston reports that the FBI has sent counterterrorism officials to the scene. The blasts happened in quick succession four hours after the beginning of the men's race while thousands were still out on the course. Two explosions rocked the finish line of the Boston Marathon this afternoon, leaving at least three dead and dozens injured, the Boston Police Department reports. The explosions happened in quick succession four hours after the beginning of the race, the world's oldest and one of the most prestigious road races in the world. At that point, the majority of 27,000 runners had crossed the finish line. Thousands, however, were still out on the course. Images posted by wire photographers and posted on Twitter showed bloodied runners lining the streets, the windows of nearby buildings blown out by the explosion. Neither the cause of the explosions nor who may have perpetrated it was immediately available. President Obama offered the people of Boston the full support of the American government. "Make no mistake we will get to the bottom of this," Obama said. "We will find out who did this and why... Any responsible individual, any responsible group will feel the full weight of justice." -- VICTIMS: As of 9:06 p.m., three people were reported dead and, according to an NPR count of patients at area hospitals, 98 were injured. -- INVESTIGATION: A White House official said they were investigating the attack as terrorism. "Any event with multiple explosive devices — as this appears to be — is clearly an act of terror, and will be approached as an act of terror," the official said. "However, we dont yet know who carried out this attack, and a thorough investigation will have to determine whether it was planned and carried out by a terrorist group, foreign or domestic." -- CHAOS: Video of the scene showed a big explosion near the finish line. The explosion was so strong, it threw one runner off his feet. A video feed of the marathon finish line showed empty stands and emergency workers on the scene. WGBH's Anne Mostue tells our Newscast unit she heard two very loud explosions within seconds of each other. Mostue said immediately after, she saw "people screaming and running toward the river." "Police [were] pushing everyone away from Copley square," WBUR's Bruce Gellerman said. "People crying, people sitting collecting their thoughts. Some of the runners still shaking." -- SECURITY: Police in Los Angeles, New York City, Washington, London and other cities worldwide stepped up security after the explosions. Public transit seemed to be large focus of their efforts, as well as large public gatherings. Note that this is still a fluid situation. Information is bound to change. We'll our best to point just to credible sources. We'll update this post as we learn more. "Officials warn that it could take some time before they can definitively say who was behind it. They are comparing the Boston Marathon explosion to the Eric Rudolph case — when an improvised explosive device went off at the Atlanta Olympic Games.The early investigation in that case indicated a security guard named Richard Jewell was behind the attack. As it turns out it was Eric Rudolph, who eluded law enforcement officials for years. "Officials say it is time to step back and calm down rather than repeat the mistakes of the past. 'These devices can be very hard to track,' a law-enforcement official said, adding that there are no signatures or tell tale signs that indicate some sort of training from overseas. Instead the devices appear to be rather generic." Boston Police Commissioner Edward F. Davis said during a news briefing that the total number of people dead has gone up to three. Davis would not comment on the condition of those injured nor would he comment on whether police have found any other explosives. Time spoke to Boston Globe photographer John Thumacki, who was very much near the explosion when it happened. "The first thing I saw were people's limbs blown off. Massive amounts of blood. It looked like BB holes in the back of some people. And a lot of anger. People were just angry. What's going on? Why is this happening at the Boston Marathon? "Maybe 15 seconds after the first explosion, while I was still shooting pictures, another explosion went off. And then there was panic. The cops told everybody to get off the street, that there could be another one. "I can't compare it to anything else I've ever been to. The horror. And the anger." He said the symbolism of the moment was not lost on him. People were on a street lined with the flags from around the world. "I think it's haunting to see: this is Boston, this is Liberty," Thumacki said. "All of this happening with all the flags of the nations. Here are people — a pile of injured people — just laying in front of these flags." NPR's Richard Knox is outside Massachusetts General Hospital. He says that the five major hospitals in Boston report that they have 93 patients. "I'm being told by the hospitals there are a lot of lower leg injuries, some of what they call traumatic amputations, which basically means limbs being blown off, and requiring major surgery to try to treat these patients," Richard told our Newscast unit. Politico, The Wall Street Journal, the AP and Reuters are quoting a White House official saying this incident will be investigated as terrorism. "Any event with multiple explosive devices — as this appears to be — is clearly an act of terror, and will be approached as an act of terror," the official said in a written statement. "We don't yet know who carried out this attack, and a thorough investigation will have to determine whether it was planned and carried out by a terrorist group, foreign or domestic," the official added. During a short statement to the country, Obama promised to find out who did this and hold them accountable. Obama also offered Boston the full support of the American government. "All Americans stand with the people of Boston," he said. Boston Police Commissioner Edward F. Davis said they had "no specific intelligence" that would have warned them of the attack. Davis said there had also been no arrests made, but that police were talking to a great number of people. President Obama will address the nation at 6:10 p.m. ET. The White House will stream the statement live on its website. NPR's Dina Temple-Raston tells All Things Considered that it will take quite a while for police to comb through the area. This is especially true because thousands of runners dropped bags as they ran away from the scene. The Boston Police Department tweeted that the area "around the crime scene will be closed for the foreseeable future." -- "Brigham and Womens' Hospital has received 18 to 20 patients, with 2 in critical condition." -- "Boston Medical Center has received 20 patients, including 2 children, all from the Marathon bombs. Most of these patients have lower-leg injuries, according to a hospital spokesperson. They don't have anything yet about condition of injured." The Boston Police Department says the third explosion, at the JFK Library, "appears to be fire related." Earlier the Boston Police said they were treating it as related to the two explosions at the finish line, but the JFK Library tweeted that fire in the building appeared to "have started in the mechanical room of new building." Boston Police Commissioner Edward F. Davis said during a televised news briefing that a third explosion happened at the JFK Library. "We believe it's related," Davis said. The JFK Library said the fire at the building has been put out and that investigators are investigating. The library said "all staff and visitors are accounted for and safe." Davis asked everyone in Boston to stay indoors and avoid congregating in large groups. He was asked if this was a terrorist attack. "We're not being definitive," he said. "You can reach your own conclusions." The Boston Globe just posted video of the moment of the explosions. You can hear the first explosion, closely followed by a second one. Then you can hear, someone scream, "We need help," as authorities start removing the barriers to help the victims. NPR's Peter Sagal tells All Things Considered that he had just finished the marathon when he heard an explosion. He said he turned his head and that's when the second explosion hit. He said he was about 100 yards from the explosion and emergency personnel immediately descended on the scene. 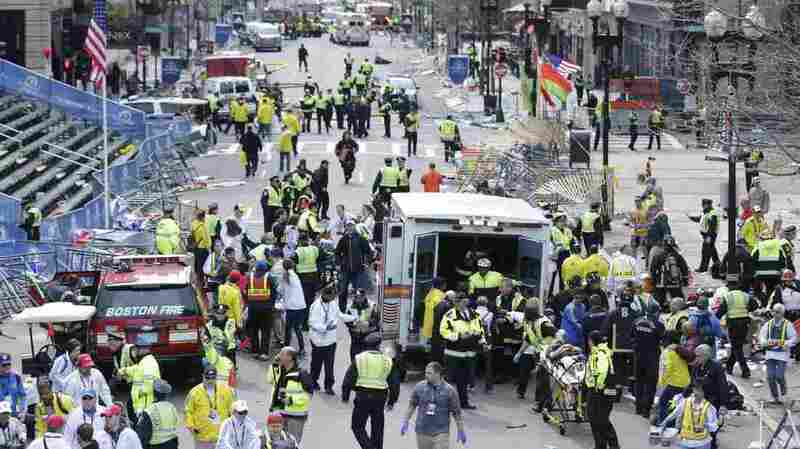 The Boston Police Department reports on Twitter that at least two people are dead and 23 people have been injured. NPR's Dina Temple-Raston reports that the FBI has sent counterterrorism officials to the scene. The White House says that President Obama has been notified of the incident and his administration is in contact with law enforcement authorities. "He directed his administration to provide whatever assistance is necessary in the investigation and response," a White House official said. WBUR is reporting that "at least a dozen are injured." CNN is reporting that at least six have been injured. "Police pushing everyone away from Copley Square. People crying, people sitting collecting their thoughts. Some of the runners still shaking," Bruce Gellerman reported. A video of the explosion shows the official marathon clock hitting 4:09 as the explosion happens. The explosion is so severe, one runner is thrown off his feet. At four hours, most runners would already have crossed the finish line. WBUR is streaming its live coverage here. The New England Cable News is streaming its live coverage here. The Boston Globe is live blogging. New England Cable News' Jackie Bruno tweeted that she was close enough to the blast that she felt the force of the explosion. "Runners were coming in and saw unspeakable horror," Bruno tweeted. She also posted a photograph of people tending to the injured. It shows one man lying on the ground, blood all over his legs. "Boom, there was black smoke," he said. "Mass chaos. I saw one woman really, really badly hurt. She was being carried out by people; she was bleeding pretty badly. It wasn't a good scene. It was awful." As Mark reported earlier, the Boston Marathon is the oldest, most prestigious marathon in the world. Tens of thousands of runners participate in the race. This is a breaking news story. We'll update as soon as we get more.